Color-enhanced USGS satellite image of Washington, DC, taken April 26, 2002. 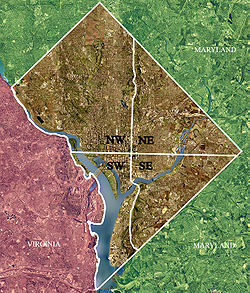 The "crosshairs" in the image mark the quadrant divisions of Washington, with the U.S. Capitol at the center of the dividing lines. To the west of the Capitol extends the National Mall, visible as a slight green band in the image. The Northwest quadrant is the largest, located north of the Mall and west of North Capital Street. the Southwest Waterfront, also called Near Southwest, is between I-395 and Fort Lesley J. McNair. Southwest Waterfront is a primarily residential neighborhood. It also is home to several Washington DC marinas, including the Washington Marina, The Capitol Yacht Club, the Gangplank Marina, and the James Creek Marina. Southwest Waterfront is in Ward 6, except for the unpopulated East and West Potomac Parks, which are in Ward 2. Buzzard Point, a largely undeveloped industrial area between South Capitol Street and Fort McNair. Buzzard Point was the home of the U.S. Coast Guard, which was headquartered in a building at the confluence of the Potomac and Anacostia Rivers. The headquarters moved to the former St. Elizabeths Hospital campus elsewhere in DC in 2013.
the area of Southwest that is south and east of the Anacostia River contains Joint Base Anacostia-Bolling together with the Naval Research Laboratory and the Blue Plains Advanced Wastewater Treatment Plant, Job Corps Center, and Fire Department Training Center. Bolling is in Ward 8.
the Bellevue neighborhood occupies all of the Southwest land between South Capitol Street (to the east) and the Anacostia and Potomac rivers (to the west and north). Included is the small Hadley Hospital. Bellevue is in Ward 8. The Blue, Orange, and Silver lines of the Washington Metro have the following stations in the Southwest Federal Center: Smithsonian, L'Enfant Plaza, and Federal Center SW. The Yellow line also stops at L'Enfant Plaza. The Green line has a stop in the Southwest Federal Center at L'Enfant Plaza and in the Southwest Waterfront at Waterfront; additionally, the Navy Yard – Ballpark stop is one block outside the eastern boundary of the Southwest Waterfront neighborhood. Southwest is part of Pierre L'Enfant's original city plans and includes some of the oldest buildings in the city, including the Wheat Row block of townhouses, built in 1793, and Fort McNair, which was established in 1791 as "the U.S. Arsenal at Greenleaf Point." Prior to 1847, much of the Virginia portion of the District of Columbia, including the town of Alexandria, was included in Southwest. Waterfront developed into a quite contradictory area: it had a thriving commercial district with grocery stores, shops, a movie theater, as well as a few large and elaborate houses (mostly owned by wealthy blacks). However, most of the neighborhood was a very poor shantytown of tenements, shacks, and even tents. These places, some of them in the shadow of the Capitol Building, were frequent subjects of photographs highlighting the stark contrast. In the 1950s, city planners working with the U.S. Congress decided that Southwest should undergo a significant urban renewal — in this case, meaning that the city would declare eminent domain over all land south of the National Mall and north of the Anacostia River (except Fort McNair); evict virtually all of its residents and businesses; destroy all streets, buildings, and landscapes; and start again from scratch. The seizure of the entire area, including well maintained properties, was upheld by the United States Supreme Court in Berman v. Parker. Justice William Douglas emphasized the squalor and segregation the area suffered, noting that the area was 98% black while 58% of dwellings had outside toilets. Only a few buildings were left intact, notably the Maine Avenue fish market, the Wheat Row townhouses, the Thomas Law House, and the St. Dominic's and Friendship churches. The Southeast/Southwest Freeway was constructed where F Street, SW, had once been. The rebuilt Southwest featured a large concentration of office and residential buildings in the brutalist style that was then popular. It was during this time that most of the Southwest Federal Center was built. The heart of the urban renewal of the Southwest Waterfront was Waterside Mall, a small shopping center and office complex, which housed satellite offices for the United States Environmental Protection Agency. The Arena Stage was built a block west of the Mall, and a number of hotels and restaurants were built on the riverfront to attract tourists. Southeastern University, a very small college that had been chartered in 1937, also established itself as an important institution in the area. Following a proposal by Chloethiel Woodard Smith and Louis Justement, renewal in Southwest marked one of the last great efforts of the late Modernist movement. Architect I. M. Pei developed the initial urban renewal plan  and was responsible for the design of multiple buildings, including those comprising L’Enfant Plaza and two clusters of apartment buildings located on the north side of M St. SW (initial termed Town Center Plaza). Various firms oversaw individual projects and many of these represent significant architectural contributions. Noted modernist Charles M. Goodman designed the River Park Mutual Homes complex. Likewise, Harry Weese designed the new building for Arena Stage and Marcel Breuer the Robert C. Weaver Federal Building  (located at 451 Seventh Street, SW) to house the newly established United States Department of Housing and Urban Development, and the Hubert H. Humphrey Federal Building. The Tiber Island complex (the design of which was essentially replicated in the adjacent projects that are now termed Carrollsburg A Condominium and Carrollsburg Square), which was designed by Keyes, Lethbridge & Condon, won an American Institute of Architects Honor Award in 1966. However, urban renewal did not fully succeed in Southwest for many of the reasons that plagued other Modernist renewal efforts. Areas of the neighborhood remained run-down, low-income, and somewhat dangerous. This situation intensified in the 1980s and the 1990s, when Washington had among the lowest per capita incomes and highest crime rates in the nation. The Southwest urban renewal has been called "a case study of everything urban renewal got wrong about cities and people." While many of the residential neighborhoods of Southwest remained both highly mixed-race and mixed-income, around 2003, the wave of new development occurring throughout D.C. reached Southwest including a number of apartment building renovations and condominium conversions. Nationals Park stadium, located on the east side of South Capitol Street and thus in Southeast, opened for the Washington Nationals Major League Baseball team in 2008, construction having cost more than $611 million. As part of the Capitol Riverfront revitalization efforts, high rise office buildings and condominiums have been constructed. Developers have created a waterfront greenspace The Yards, and a waterfront bike trail is planned. Public Housing projects continue to occupy the area between the Waterfront metro and the Nationals Park stadium. On April 16, 2010, the new Waterfront Safeway (including a sushi bar)  and a Starbucks opened for business. Coordinates: 38°52′52″N 77°00′58″W﻿ / ﻿38.881228°N 77.01622°W﻿ / 38.881228; -77.01622 Along Water Street, "The Wharf" includes restaurants, shopping, theaters, public piers, hotels, and high-rise housing; the first phase opened in October 2017 (see Redevelopment of Southwest Waterfront). L'Enfant Plaza is also undergoing a facelift, with new retail and hotels, as well as office renovations. In April 2017, the National Capital Planning Commission (NCPC) approved plans for a staircase and ramp that will travel through a grassy slope in Benjamin Banneker Park to connect L'Enfant Plaza to the Southwest Waterfront and to add lighting and trees to the area. The NCPC and the National Park Service intended the project to be an interim improvement that could be in place for ten years while the area awaits redevelopment. Hoffman-Madison Waterfront (the developer of "The Wharf") and the District of Columbia government agreed to invest $4 million in the project in an effort to improve neighborhood connectivity in the area. Construction began on the project in September 2017. Current residents include U.S. Congressman John Conyers. Former residents have included Vice President Hubert Humphrey, Police Chief Charles Ramsey, and Supreme Court Associate Justices Lewis F. Powell, Jr., Thurgood Marshall, David Souter, Senators Paul Simon, Strom Thurmond, and Kay Bailey Hutchison, Congresswoman Carolyn Cheeks Kilpatrick, former Speaker of the House Dennis Hastert, entertainers Al Jolson and Marvin Gaye, and opera star Denyce Graves. ^ Olitzky, Kerry. The American Synagogue: A Historical Dictionary and Sourcebook. Greenwood Publishing Group. p. 92. ^ (1) "Washington, D.C.: A Challenge to Jim Crow in the Nation's Capital". Separate Is Not Equal - Brown v. Board of Education. Smithsonian Institution: National Museum of American History: Behring Center. Archived from the original on January 4, 2018. Retrieved January 4, 2018. (2) Williams, Paul K. (2005). Chapter 5: The Southwest Neighborhood: 1870-1950. Images of America: Southwest Washington, D.C. Charleston, South Carolina: Arcadia Publishing. p. 83. ISBN 0738542199. LCCN 2005935864. OCLC 69989394. Archived from the original on January 5, 2018. Retrieved January 4, 2018 – via Google Books. ^ "U.S. Army Corps of Engineers" (PDF). usace.army.mil. Archived from the original (PDF) on April 9, 2008. Retrieved March 23, 2008. ^ "Pei Cobb Freed and Partners". pcf-p.com. Archived from the original on 2008-07-05. Retrieved 2008-03-23. ^ "Robert C. Weaver Federal Building (HUD), Washington, DC". gsa.gov. Archived from the original on October 12, 2007. Retrieved April 11, 2007. ^ "AIA Honor Awards 1960–1969". aia.org. Archived from the original on April 12, 2008. Retrieved March 23, 2008. ^ "Waterfront Safeway Open for Business". NBC Washington. Retrieved May 5, 2010. ^ (1) "About District Wharf". District Wharf. PN Hoffman; Madison Marquette. 2018. Archived from the original on January 4, 2018. Retrieved January 4, 2018. (2) Freed, Benjamin (March 19, 2014). "The Wharf Breaks Ground in DC's Southwest Waterfront: The first phase of the $2 billion project will include hundreds of new residences, shops and restaurants, and a massive concert venue". Washingtonian. Washingtonian Media Inc. Archived from the original on January 4, 2018. Retrieved January 4, 2017. (3) Sadon, Rachel (October 2, 2017). "The Wharf's Grand Opening Involves Four Days Of Events, And Kevin Bacon Is Involved". DCist. Gothamist, LLC. Archived from the original on January 4, 2018. Retrieved January 4, 2018. (4) Iannelli, Nick (October 12, 2017). "The Wharf opens along DC's Southwest waterfront". WTOP. Archived from the original on January 4, 2018. Retrieved January 4, 2018. ^ "Overview". L'Enfant Plaza. Archived from the original on March 7, 2013. Retrieved January 4, 2018. ^ (1) "Environmental Assessment: Benjamin Banneker Park Connection" (PDF). National Mall and Memorial Parks. Washington, D.C.: National Park Service. March 2016. Archived from the original (PDF) on November 16, 2017. Retrieved November 16, 2017. (2) Koster, Julia; Staudigl, Stephen (April 6, 2017). "NCPC Approves Banneker Park Pedestrian and Cyclist Access Improvements" (PDF). Media Release. Washington, D.C.: National Capital Planning Commission. Archived from the original (PDF) on November 13, 2017. Retrieved November 13, 2017. (3) "Banneker Park Pedestrian Access Improvements" (PDF). Executive Director's Recommendation: Commission Meeting: April 6, 2017 (NCPC File No. 7551). Washington, D.C.: National Capital Planning Commission. Archived from the original (PDF) on November 13, 2017. Retrieved November 13, 2017. (4) Voigt, Eliza. "Benjamin Banneker Park Pedestrian Access Improvements". National Mall and Memorial Parks. Washington, D.C.: National Park Service. Archived from the original on November 13, 2017. Retrieved November 13, 2017. ^ "Construction on Benjamin Banneker Park Pedestrian and Bike Access Project begins ahead of The Wharf's October 12 Launch". Washington, D.C.: Office of the Deputy Mayor for Planning and Economic Development: Government of the District of Columbia (DC.gov). 2017-09-08. Archived from the original on November 13, 2017. Retrieved November 13, 2017. ^ "With a Good Cough". time.com. November 25, 1966. Archived from the original on February 20, 2008. Retrieved December 13, 2007. ^ "Kay Bailey Hutchison Sells Her Southwest Digs". UrbanTurf. November 2, 2012. Archived from the original on April 2, 2015. Retrieved March 23, 2015. ^ "Southwest Neighborhood - Fun Facts". Southwest Neighborhood Assembly. November 25, 1966. Archived from the original on July 28, 2011. Retrieved December 9, 2010. Wikimedia Commons has media related to Southwest, Washington, D.C.. This page was last edited on 26 February 2019, at 05:59 (UTC).